Highly reliable, intuitive access control systems offering sophisticated technology at an affordable price point, our access control units help regulate entry into highly secure areas. We offer a variety of biometric modalities to choose from based on your own unique needs. 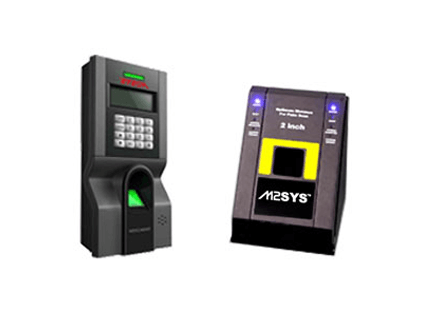 With the ability to perform either one-to-one (1:1) or one-to-many (1:N) searches, M2SYS offers a choice of two different access control authentication systems to help secure sensitive areas and ensure only authorized personnel can gain entry. Built and designed with innovative biometric technology and modern design, we feature the choice of either fingerprint or palm vein access control depending on the context of your deployment needs. M2-EasyAccess™ is our highly reliable fingerprint access control watch-dog terminal that efficiently and accurately identifies users to admit them into highly secure areas. The system not only boasts high-end technology, but also a very affordable price point and includes many administrator-friendly features including 50 time zones, holiday management, and other standalone components. The M2-EasyAcess™ Control System also has a one-way alarm output system to sound a variety of alarms including a dismantlement alarm, threaten alarm, illegally unlock alarm, and a block alarm. Easy to install this intuitive unit can be setup and operated independently from other systems. An easy replacement for an existing card access control system, the output protocols in the M2-EasyAccess™ Control System include a wiegand interface and door-locking properties. Offering robust biometric authentication to enhance physical security, M2-PalmAccess™ uses contactless, hygienic, and non-invasive palm vein authentication to identify individuals without leaving any biometric footprint or residual trace after authentication. Providing fast and easy enrollment, the M2-PalmAccess™ access control device can be remotely mounted in any secure area and features an encrypted template repository and a compact design with flexible integration and easy installation into existing access control systems via Wiegand or IP interfaces.